The ability to reason is man's most important faculty - the attribute which lifts him above all other species. Yet, the science of using his rational faculty effectively has been almost entirely neglected. Most people fail to realize that thinking is not an automatic process, known to everyone "instinctively." It is, indeed, an acquired skill and - like every human skill - it involves certain principles which have to be identified and learned. 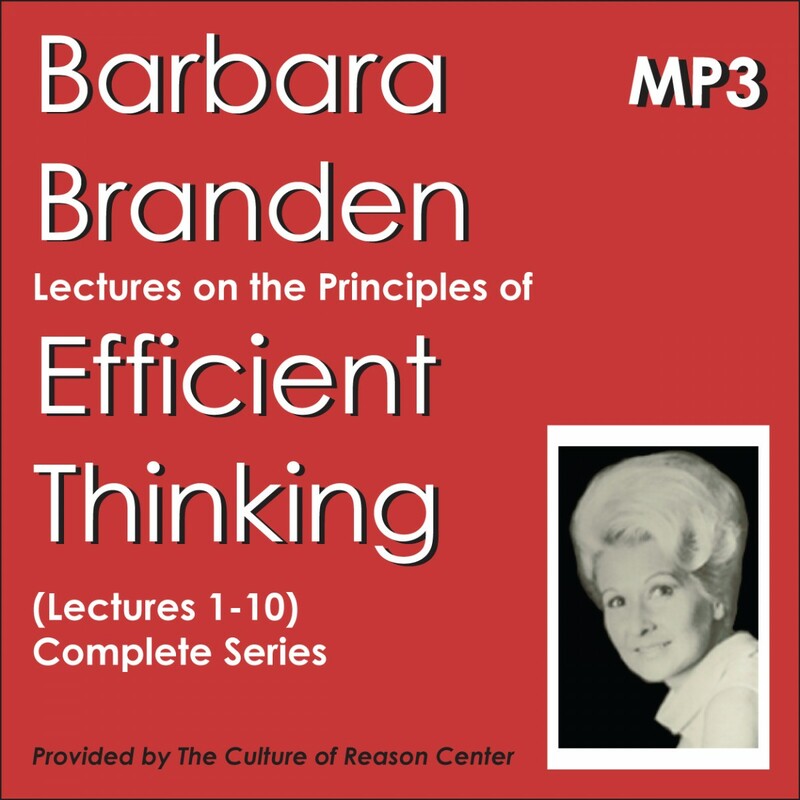 Principles of Efficient Thinking was developed by Barbara Branden to help meet this need. Her course deals with thinking in both its theoretical and practical aspects. The theoretical aspect covers in detail the principles that make possible the most efficient use of one's mind; the practical aspect covers specific techniques by which one avoids thinking errors and maximizes the productiveness of one's mental effort. As part of the curriculum of the Nathaniel Branden Institute (NBI), the course was attended by tens of thousands of students in cities throughout the United States and Canada. With the exception of lecture nine, which is a guest lecture by Nathaniel Branden, the course is given by Barbara Branden. Many of the lectures were re-recorded to improve sound quality, to slightly revise errors, to update references, and to make the contents readily understandable to those with no previous philosophical training. This course is substantially the same as that offered by NBI and it proved to be one of the most popular series offered by the Institute. - Why a science of thinking is necessary. - The relation between efficient thinking and intelligence. - The philosophical base of efficient thinking. - The nature of intellectual focusing. - The various levels of focusing. - The problem of concentration. - The nature of the subconscious. - The subconscious as a "Univac" (computer). - The proper use of the subconscious. - The psychology of "inspiration." - The effect of repression on thinking. - The nature of the conceptual level of consciousness. - The nature of intelligence. - The destroyers of intelligence. - The destructiveness of treating emotions as tools of cognition. - The manner in which wishes and fears can distort the thinking process. - The importance of knowing the source and validation of one's concepts. - The role of integration in thinking. - Forms of the failure of integration. - Evasion as the sabotaging of consciousness. - Common aberrations in thinking and consequent mental habits. - The inability to think in principles. - The misuse of abstractions. - The "socialized consciousness" and the destruction of language. - Failures of discrimination in thinking. - The error of intellectual "package-dealing." - The danger of false axioms. - Psychological causes of inefficient thinking: the surrender of the will to efficacy; failure of self-esteem; the "malevolent universe" premise; "social metaphysics." The source and conditions of intellectual certainty. Permission to offer this product has been given from Barbara Branden who holds the copyright.